What is global citizenship? What does global citizenship require of us, and our universities? Students and faculty from six universities – Dartmouth College (USA), Durham University (UK), University of Otago (New Zealand), Queens University (Canada), University of Tübingen (Germany), and Uppsala University (Sweden) – came together in Uppsala in April 2016, for the 1st international workshop to develop the new Global Citizenship Program in the Matariki Network of Universities. The workshop used creative and interactive methods to engage both students and faculty, explored critical understandings of global citizenship, and was the first step in forming the content of the Matariki Global Citizenship Program, and its next steps. The Ustinov Annual Conference 2016 seeks to bring together wide-ranging perspectives on the contested notion of global citizenship and its value in a global context. Participants are invited to address and engage with theoretical understandings of global citizenship, its political uses, and the lived experience of global citizens. Faculty and students from seven universities will come together in the first ever international meeting for the new Global Citizenship Program for the Matariki Network of Universities, MNU. The 2,5 day workshop will begin at 13:00 on Monday April 18th and finish Wednesday 20th April at 17:00, followed by an open half day event on the morning of Thursday 21st. The ongoing operations of the Global Citizenship program are under development in this workshop. Possibilities may include for example online/distance exchange activities and collaboration, research projects and funding initiatives, travel and exchanges between partner universities, educational offerings across institutions, funding possibilities for student or staff initiated projects, development of new educational models, sharing of ideas and models for community engagement, and more. Delegates from Uppsala and MNU partner universities will bring with them their own ideas, experiences and suggestions to contribute to forming the initiative’s future. Empowering Learners is inspired by the idea that students are key stakeholders of the future. It aims to identify, discuss and develop initiatives and approaches in which students are active co-creators of higher education, and through empowering experiences are acquiring the tools, mind-sets and courage to be able to act as global citizens. Community Engagement As the word Matariki, in Maori, has come to mean a celebration of the unique place in which we reside, and the giving of respect for the land on which we live, a place-based and community-centered approach to educating global citizens seems appropriate. This strand calls for MNU initiatives that enable students, through multi- and transdisciplinary work modes, to become community-engaged, socially and environmentally aware learners. Open Strand This open strand invites ideas for key strands of a global citizenship program that partner universities in the MNU are particularly interested in exploring further, and which would complement and build on the already suggested strands. Delegates from UU will have the opportunity to also suggest strands. The MNU includes seven partner universities: Uppsala University, Dartmouth University in the United States, Durham University in England, Otago University in New Zealand, Queens University in Canada, University of Tubingen in Germany, and the University of Western Australia. A group of members of UU faculty will join as part of the Uppsala representation at the workshop, so please contact us if you would like to participate. As expressed in the text above, the workshop and ongoing program aims to offer significant potential for new education and research initiatives between partner institutions. The deadline for staff interest is latest 30 March. We invite faculty from all departments who have a connection and interest through research, education or experience to the theme of global citizenship to apply. For more information about other delegates from abroad (who else is coming) see the table below, which will be updated as more confirm. For more on how to join the workshop, time commitments, etc. please contact us on the emails given above. Jasmine Simms, Student Education (with English) Year 2, activist, poet, and member of a local Unite Community branch. Dr. Anna Taylor, Assistant Professor . Dr. Taylor and Ms Andrews are based at the Bader International Study Centre (BISC) in the U.K.
Prof. Volker Hochschild, Geographical information systems (GIS), energy management of buildings, sustainable campus systems. Magdalena Kuchler, Postdoctoral Researcher in Global Energy Systems, Natural Resources and Sustainable Development, Department of Earth Sciences. Research in political ecology, climate change governance and global energy governance. Research project in collaboration with Durham university. Thomas Nygren, PhD, Researcher and Senior Lecturer at the department of Education, Uppsala University. Juan Carlos Forero Mauritz, Sinologist, human geographer and social entrepreneur. Major in Chinese/Minor in Social and Economic Geography. No delegation will visit Uppsala for this workshop. Faculty and student representatives will participate via video link, and other virtual means. What is required of universities to truly educate, research and engage for global citizenship? What is the role of students and faculty in co-creating Uppsala University’s contribution to the Matariki Global Citizenship Program? 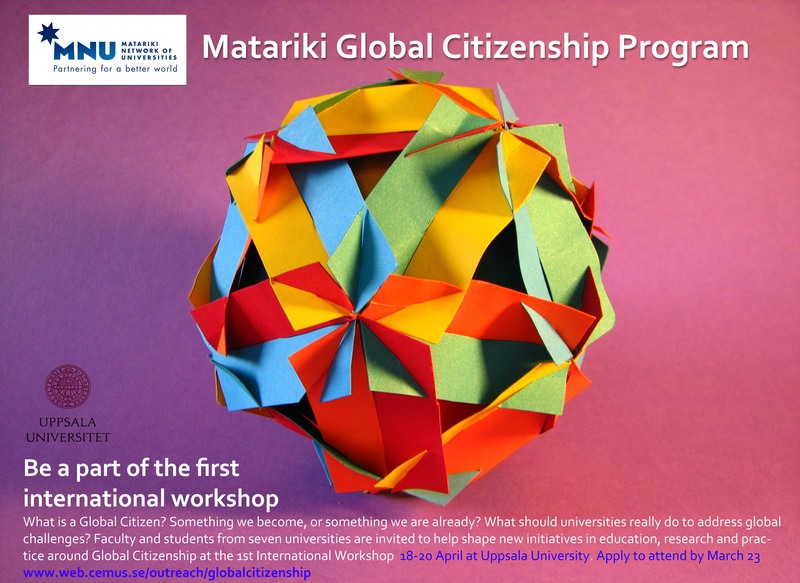 How will the new Matariki Global Citizenship Program go forward after the 4 day Uppsala 1st international Workshop? We invite anyone interested in connecting to or hearing more about this exciting initiative. Brian Palmer is a social anthropologist and scholar of religion at Uppsala University in Sweden. Previously he held the Torgny Segerstedt Guest Professorship at Gothenburg University, and before that he taught at Harvard. His courses there on civic courage and engagement attracted as many as 600 students per term, and in 2002 Brian was awarded the Levenson Prize as Harvard’s best lecturer.